With industry-leading skunk removal services, our Houston team is available to help you with skunk infestation 24 hours a day, seven days a week. If you suspect a skunk is living on or around your property, call us as soon as you can. Skunks can be dangerous, not to mention noxious smelling. Our team will devise a humane removal plan to get the skunk and its smell out of your life. We work to trap the skunks and relocate them to a natural space where they will not be a nuisance for your family or customers. Actually spotting a skunk can be quite rare. You’re more likely to notice their presence after they’ve sprayed your property or pets. Because we know their habits and tendencies, we will quickly locate and safely remove any offending skunks from your residential or commercial property. 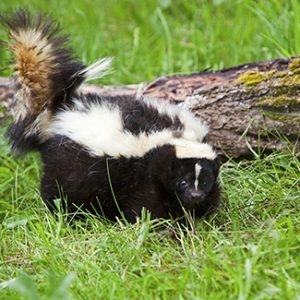 Call us today if you fear there might be a skunk on your property and we’ll send one of our experts out as soon as possible to perform skunk removal services. We are dedicated to ensuring the safety of you and our experts, and we promise reliable and efficient service.